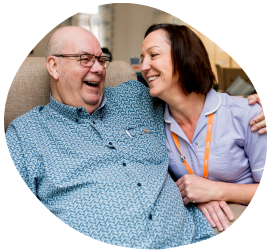 The proceeds from the lottery help fund the care of 1 in 10 of our patients and by playing our lottery, you are helping to care for local people and families living with a potentially terminal illness. “The level of support I and my children received from St Giles was overwhelming. The Hospice at Home team was spectacular and they also gave Alice round-the-clock care over the entire Christmas period. Having Alice at home was the best solution, and the help that the team gave also allowed me to get some respite. Your support matters – please help us make every moment count for people like Alice and her family. Thank you. Our new look lottery leaflet features Don Smith, a day hospice patient from Lichfield, who has been coming to St Giles for seven years. Don, who was diagnosed with Motor Neurone Disease ten years ago, said he felt honoured to be featured on the new leaflets and posters. “Being the face of the lottery is wonderful and my family are so proud of me, they joke I will be signing autographs next! “I’m delighted to be involved because coming to the hospice has really brought me out of my shell. All the nurses are so friendly – I love coming every week. Your support matters – please help us make every moment count for people like Don and his family. Thank you.